The patience and persistence of Eli Kahn pays off as 44 West goes forward. All design work and renderings of 44 West are the property of Bernardon. Five Seconds. That’s how long it takes a pedestrian to decide if he or she wants to continue walking down any given urban road based on the appeal of its storefront and restaurant commercial streetscape, according to Dr. Timothy Cassidy, a principal at West Chester architectural firm Bernardon. For pedestrians walking the streets of the borough, however, the corner at the intersection of Church and Gay Streets has become…. well, a bit less than appealing in recent years. Bleak and blighted, a large, empty building stood at one of the busiest intersections smack in the center of town, looming in stark contrast to the otherwise vibrant panorama of West Chester’s downtown scene—a sight that has probably caused many a pedestrian to make a less-than-five-second decision to head in a different direction. But perhaps the solution to an impatient pedestrian can be found in a patient real estate developer. A very, very patient one. 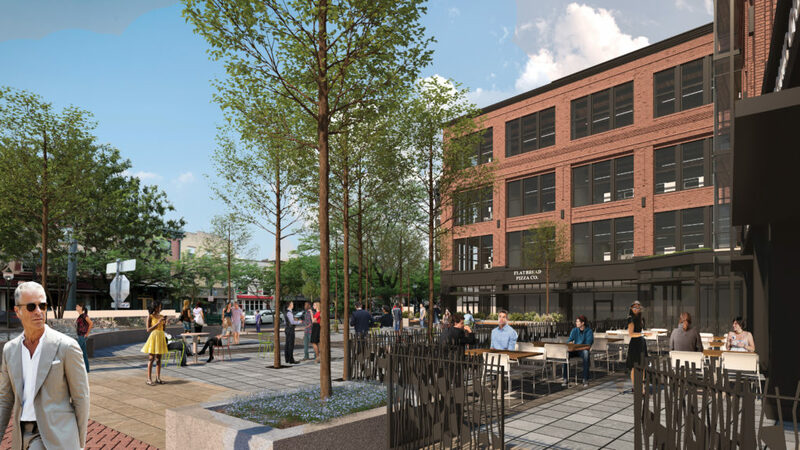 The patient developer in question here is Eli Kahn, and the streetscape is known as Mosteller’s Corner, a spot with a history as storied and varied as the borough itself. Tracing back to the “First Block” of the West Chester borough, starting off as a hotel called Cross Keys all the way back in 1786, it has by turns harbored Mosteller’s Inc.—once the largest retailer in Chester County—and eventually morphed into the local government offices of the courthouse complex. But for several years now, the building has languished, and Kahn has revisited and revamped his vision for the prime parcel again and again in the face of opposition—as well as a groundswell of steadfast supporters. It’s been a long road; in fact The WC Press first talked with Kahn about this project almost exactly four years ago for our January 2015 Real Estate issue. 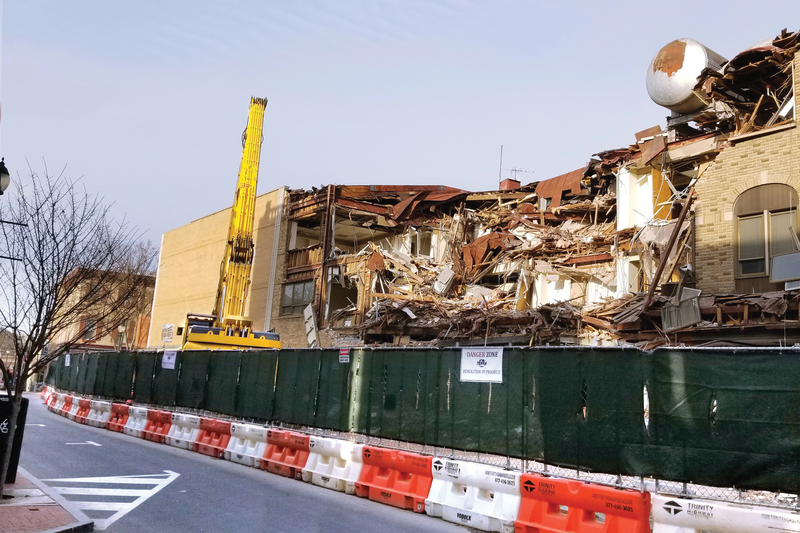 The wheels were finally set in motion on October 16 of last year, when Borough Council gave final approval for the project, and demolition at the site began on December 7. The new project, dubbed 44 West, is a somewhat relent-less mission finally realized by Kahn, and his hard-fought vision is being brought to life by Bernardon. A new view, seen from the same angle and location as the previous photo. The trick with the 44 West project has been to update the location without creating something that would stick out like a sore thumb, and Kahn and Bernardon had one word in mind when coming up with the building’s design: time-less. 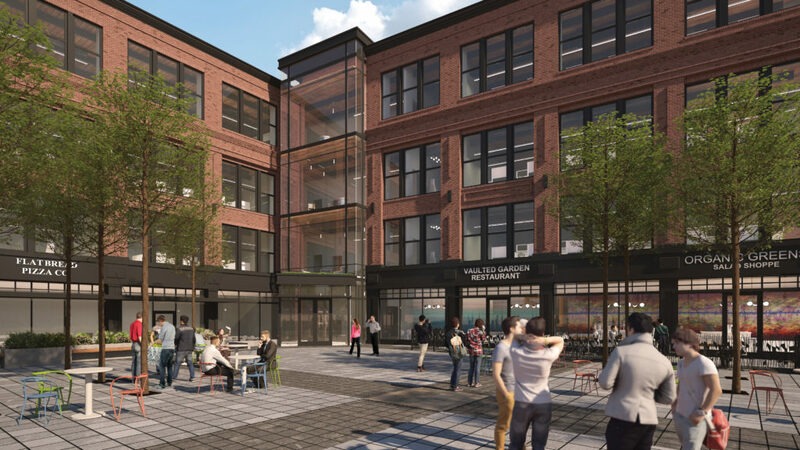 The final version of 44 West is a four-story, 44,000 square foot building with retail and restaurant space on the ground floor and office spaces above. The building will feature lots of windows to let in natural light, something that Kahn says is in high demand for modern commercial tenants, and scarce in a town with so many historical building. 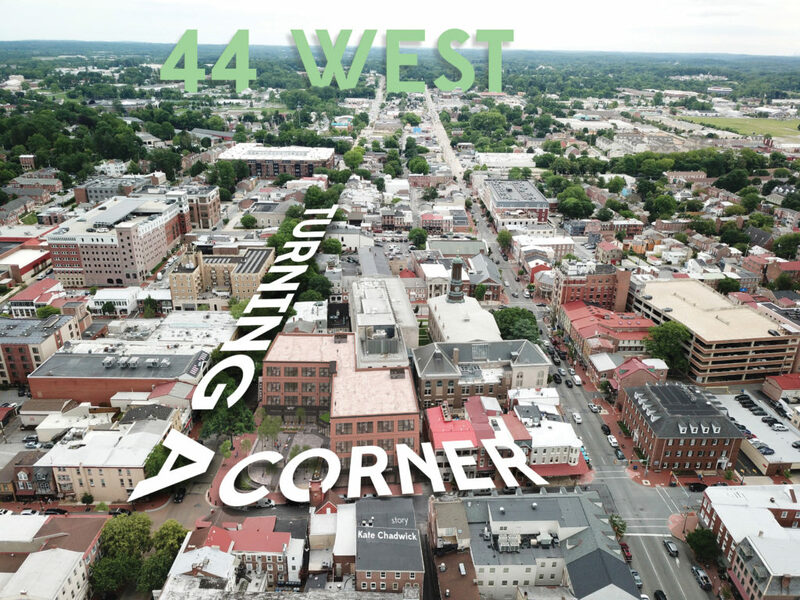 The 44 West project is expected to entail a couple of months of demolition prior to the construction phase, which is expected to take approximately 10-12 months. This means if all goes well, the project will meet its targeted completion date at the end of this year. As for the tenants who will occupy the new space, well, Kahn seemed pretty enthusiastic about that as well. “I can’t make a formal announcement on that,” he told us. “But let’s just say that I am presently oversubscribed. If I could have added another floor to the building, I could have easily leased it.” That’s no small feat, considering that the first floor can accommodate up to four commercial tenants, and the office space floors can accommodate up to six office tenants on each floor, according to Leibman. “However, they can be of varying sizes and will depend on the tenant, so an exact number of offices per floor is not known at this time,” he said.